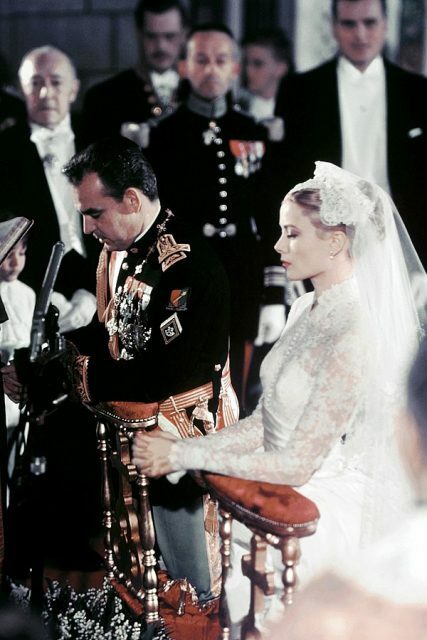 The wedding of Hollywood actress Grace Kelly and Prince Rainier of Monaco took place on April 19, 1956, in Monaco. To this day, it is considered as the most stylish, dreamy wedding on record. 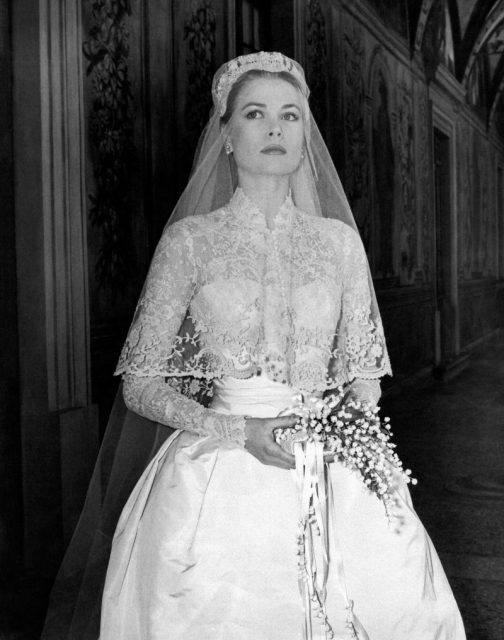 What is most remembered about this royal wedding is Grace Kelly’s wedding dress. It is the most popular wedding dress in the world and continues to inspire brides and designers for creating new models. It was assumed that Edith Head, a close friend of Kelly and a famous American costume designer, would be asked to design the wedding dress. However, Kelly asked Helen Rose, a double Academy winning designer who worked in the wardrobe department of MGM. Helen Rose worked closely with Kelly in designing the dress that used over 400 yards of fabric, including a 125-year-old rose point Brussels lace. 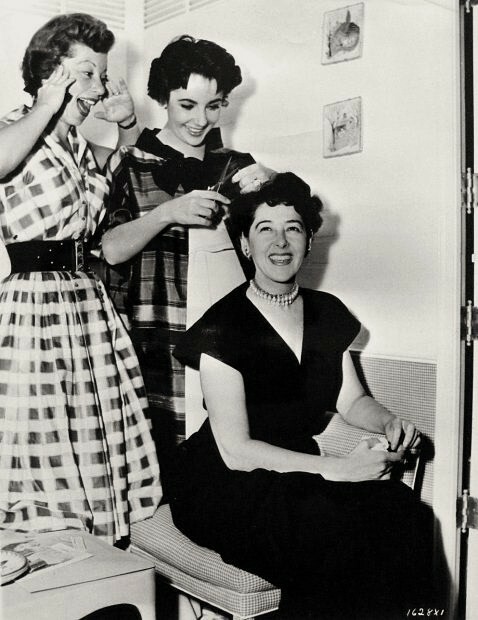 L. to R. : Annabella Levy (hairdresser), Elizabeth Taylor, and Helen Rose (costume designer) on the set of Rhapsody (1954) – publicity still. The dress broke down into ten parts, all created piece by piece. The skirt was made of ivory faille with three petticoats: a smoothing petticoat, ruffled petticoat, and foundation petticoat. The gown was made of 100 yards of silk net. There was also the skirt support, the under bodice, and the lace bodice which came with a slip. The veil, 90 yards long, was made of very fine, lightweight netting, and it was specially designed to keep her face as visible as possible. As an A-list movie star, Kelly’s wedding attracted the attention of 30 million viewers who observed from afar, while the ceremony was attended by 600 guests. Instead of a tiara, Kelly chose a Juliet cap to hold the veil. The headpiece was adorned with lace, orange blossoms, and jewels such as seed pearls. Finally, a train insert and silk faille cummerbund completed the outfit. Instead of lots of flowers, in the style of devout mid-20th-century brides, Kelly carried a Bible. She received the book as a gift which was later embellished with silk, lace, and pearls at MGM. She also carried a petite bouquet of lilies-of-the-valley. 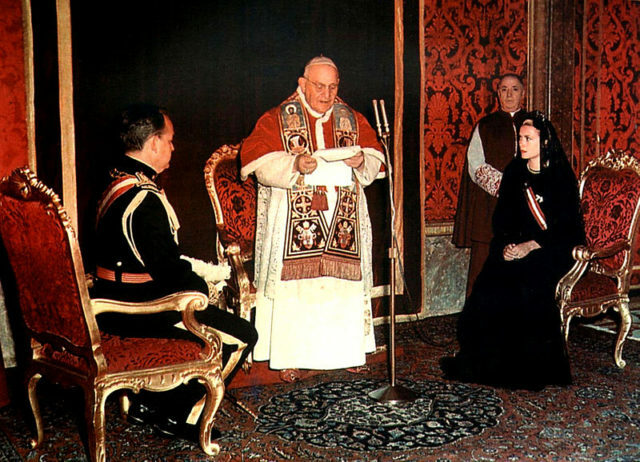 Princess Grace and Prince Rainier before Pope John XXIII at Saint Peter’s Basilica in Rome, 1959. At the time, the estimated manufacturing and material cost of Kelly’s bridal dress was $7,266, without the designer’s fee, and the fee for the 30 seamstresses that worked for six weeks. And it was the wedding gift from MGM Studios to their beloved actress Kelly Grace. 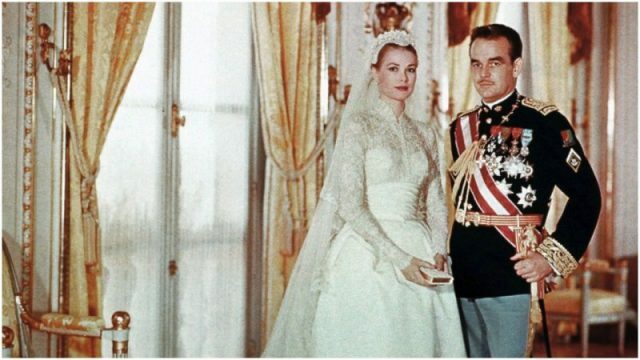 Since Prince Rainier’s height stood close to Kelly’s height, she wore just 2½-inch heels. The pumps were designed by David Evins, the “King of Pumps” and the “dean of American shoe designers.” He added lace and seed pearls. In the left shoe, Evins embossed Kelly’s name and his own in the right shoe. He also put a copper penny in the right shoe for good luck. The wedding involved two separate celebrations – the civil ceremony and the church marriage held on consecutive days. Kelly wore her wedding dress on the second day, while at the civil ceremony she wore a pink floral ensemble, accessorized with a Juliet cap. Again, the design was by Helen Rose. There was one columnist who wrote that Kelly’s dress was beautiful but hardly an outstanding one. However, the consensus was that the gown was magnificent. And it still is. Today, the dress is owned by the Philadelphia Museum of Art. 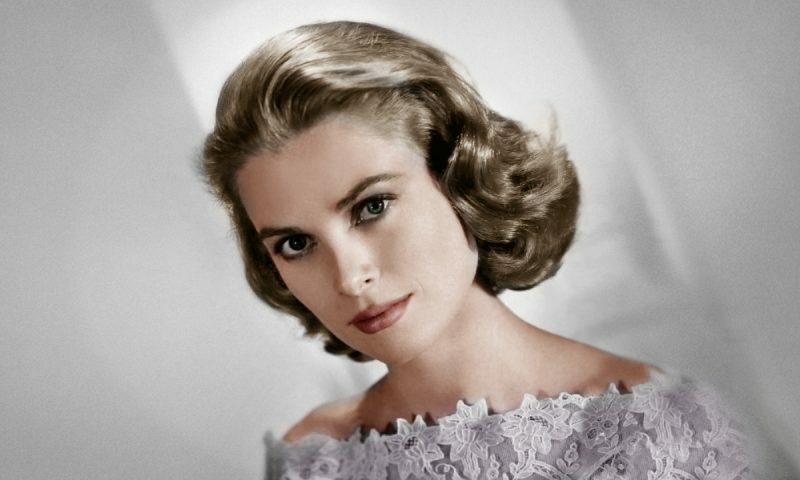 In 2006, for the celebration of the 50th anniversary of Grace Kelly’s wedding, the museum displayed the dress through the months of April and May, later reporting that it was probably the most popular exhibition in the Museum.